The HomeSpun Web Builder allows you to add and edit content to your website with such ease, you won't need to spend hours reading an instruction manual to get started. Just click on "Edit your Website," and start creating!! Blogs are a fabulous interactive means of communication between you and your client. Write a blog, then read the comments your followers post. Learn to spot trends and discern your clients' needs and concerns. Test out new ideas before you invest a lot of money in a campaign, then track your responses. Blogs should benefit you and your client. Blog ideas can come from anywhere. Write a "How To" a "Best" list, "Strategies and Tips." Ask readers for blog ideas then blog about the things they want to know. Make it fun with fresh ideas. Use your own voice, not stiff corporate rhetoric. When you blog, your clients connect with you on a more human level and will want to conduct business with you! Adding a calendar to your website, keeps clients and employees up to date with the details and dates of events, meetings, classes and more. HomeSpun Website has beautiful responsive mobile friendly designs. Step 3) CLICK on the color you want and you're done! Try different looks until you find the one that suits you. It's so much fun, you'll want to try them all! HomeSpun Websites is amazing! They gave me full attention and creativity when building my web page. Their knowledge and input made my site come together easily and with little knowledge on my part. They not only made it easy to access different parts of the site, but also taught me how to edit and add information on my own. I love my website and have gotten many compliments and clients from it. 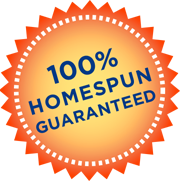 I would recommend HomeSpun Websites without any reservation.